This large anthology is subtitled â€œA Connoisseurâ€™s Collection of Victorian Detective Storiesâ€. Iâ€™m no expert of this genre but looking at the contents, itâ€™s clear that this is a juicy book. Included herein are stories by William E Burton, Edgar Allan Poe, Charles Dickens, Wilkie Collins, Arthur Conan Doyle and Mark Twain: 22 in all. Actually, there are a couple of non-fiction pieces, including a newspaper article and an inquest transcript from a certain Jack the Ripper case. Truly fascinating stuff. 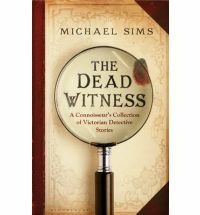 Editor Michael Sims adds a good general introduction to the Victorian detective, plus pieces for each story in the anthology. He suggests that Poeâ€™s Dupin story (â€œThe Murders in the Rue Morgueâ€ ) kicked off the detective story genre, but mentions that â€œThe Secret Cellâ€ by William E Burton (reprinted here for the first time) was published in 1837, a few years before Poeâ€™s masterpiece. This is an excellent anthology, and an excellent introduction to the detective tales of the Victorian era.